South Sudan's hunger crisis has eased after a "green harvest", but about 1.5 million people are still in desperate need of food aid, experts say. The situation could worsen next year, when a further one million people could find themselves in a "crisis" or "emergency", they added. 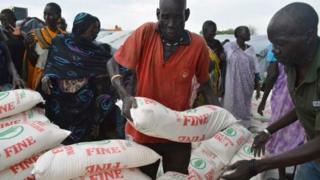 The charity Oxfam warned earlier this month that South Sudan could "tip into a famine" next year. The crisis has been blamed on conflict between government and rebel forces. Conflict broke out in December after President Salva Kiir accused his sacked deputy, Riek Machar, of plotting a coup. He denied the charge but later marshalled rebel militias and the dispute escalated into ethnic fighting. The unrest has displaced nearly two million people in the world's newest state which became independent in 2011. Mr Kiir, aid agencies and UN officials have all warned that South Sudan risked a famine if the conflict continued. However, the Integrated Food Security Phase Classification (IPC) group, made up of experts from the UN and aid agencies, said "food security across the country has begun improving". This was expected to continue until the end of the year, particularly in areas not affected by conflict, it said in a report. Normal rainfall, good crop planting and the start of a "green harvest" have had a "positive effect" on food production, the group added. However, food production remained much worse compared to a typical year at harvest time, it said. About 1.5 million people were expected to remain in a "crisis" or "emergency" situation until December and the number could rise to 2.5 million next year, the IPC added. "Severe challenges include early depletion of household food stocks, dysfunctional markets, loss of livelihoods and displacement - all resulting from protracted conflict," it said.